I don't have sweet tooth but everytime I crave for something sweet, I would go for coconut macaroons over chocolate bars. The main ingredient is self-explanatory :) Most of the time, my daughter helps me in baking this sweet chewy treats, it's like our bonding moments together aside from watching movies. 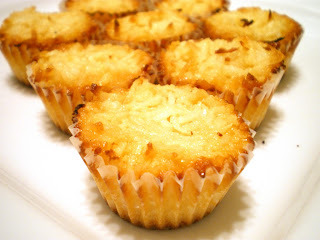 I remember when I was still back home I used to order Coconut Macaroons from a former co-worker during special occasions and it always has been the first to be gone from the table. Last Christmas, I baked some and gave them to my friends as home-made presents. Preheat your oven to 325F. Mix all ingredients thoroughly. Put them in a non-stick cup mini muffin pan with paper cups, 3/4- full only. Bake for 12 minutes or until it turns brownish, or until the toothpick comes out clean.